There are two basic categories of good food-- inventive, unique combinations that fuse together ingredients and flavors you wouldn't expect, and cooks who take classics and make them better than you've ever had them before. Both can be delicious, nutritious, and hit the spot whether you're out for a fast lunch or are dining to impress. And, fortunately, both can be found in Chattanooga. Today we're blogging about the later category-- Chattanooga's best restaurants for classic favorites done better than anywhere else in town, or for that matter, out of town. These are the places that are local-vetted and local-approved. Copyright © VIPNYC - Creative Commons. 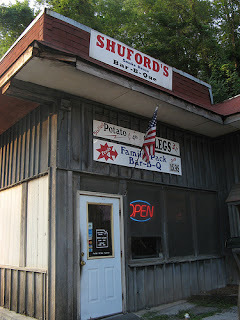 Shufford's Smoke House is a Chattanooga legend. It's where you go if you are serious about barbecue, or even if you're not. If you aren't, but want to be, eating at Shufford's is surely the thing that will transform you. One Yelp commenter explains the Shufford's magic, "Shuford's is the only non-chain, pulled, smoked pork, not pre-sauced real barbecue joint left in Chattanooga." Indeed, it's outlasted many a barbecue joint in town and has been an institution for over 20 years despite an out of the way little location at the foot of Signal Mountain. Whether you want to come for the pulled pork, the banana pudding, cater a wedding, or order a whole roasted pig for a party, Shufford's does barbecue old school, proving that timeless quality is always in good taste. River Street Deli is THE place to get a proper New York deli experience in the Scenic City. Freshly sliced meats and cheeses piled high on quality bread, with a fat dill pickle spear-- after a lunch at River Street, you'll feel that Katz's Deli isn't quite so far away. River Street has been tucked away in the Coolidge Park side of Frazier Avenue's restaurants and shops for years, always consistently serving up classics like roast beef and horseradish and sandwiches that are a little different, like the ham sandwich with granny smith apple slices tucked into the mix. Add to the best take on sandwiches in town the excellent service and walls lined with local artwork, and you've got a new favorite indeed. Sound tasty? For a more in depth coverage of the River Street experience, check out Chattavore's review of River Street Deli! Urban Stack's motto of "Killer Burgers and Manly Drinks" says it all. This restaurant takes two Southern American classics-- burgers and bourbon-- and turns them from just a dish and a drink into two genres that play off one another. You can get a basic cheese burger, dressed up with top quality cheddar and the house recipe chipotle ketchup, or you can get one of Urban Stack's inventions, like the Jive Turkey burger with tomato-pepper relish, smoked gouda cheese, lettuce and black-raspberry mayo. Every order comes with their special fire and ice pickles, and side dishes are unique deviations from the usual potato salad and slaw with offerings like blueberry salad. They are even cater to vegetarians and vegans with not one, but two different types of veggie paddies. One is a familiar Boca-style black bean burger, the other is a mushroom-based patty that overs a different flavor and texture. Add in the extra bonus that the building is LEED certified, and Urban Stack is hard to beat. Check back in the future for more tips on how to eat like a local!